Insights are Design Elements in the Design OF Strategy – Tools for strategic and strong-minded thinkers! Strategic thinking is an individual activity that produces insights for use in strategy development. The appearance of insights signifies a deepened understanding of factors that are meaningful and relevant to the strategic question at hand. Use insights in your design OF strategy. Rumelt explains that “Strategy is more like designing a high-performance aircraft than deciding which forklift to buy.” Rumelt concludes (see page 140), “Good strategy is design, and design is about fitting various pieces together so they work as a coherent whole.” These various pieces involve tradeoffs, a point that I’ll discuss shortly. If there is a great competitive challenge, and limited strategic resources, then the strategist has to have a clever and tight integration of resources and actions. If there are higher quality resources, then there is a lessened need for the tight integration of resources and actions. Rumelt identifies three elements of design of strategy: competitive challenge, strategic resources, and actions. I illustrate in nearby graphic with the added notation that the search is for insights. 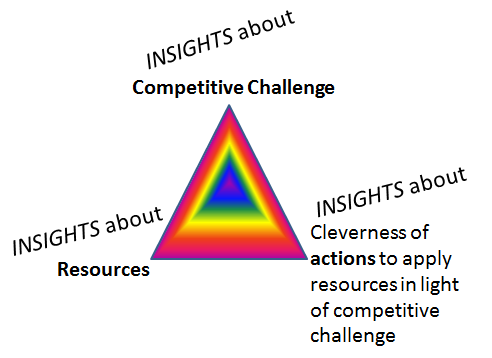 Thus, the design of strategy framework, involves working with three things: insights about the competitive challenge, insights about strategic resources, and insights about actions to apply the resources. The strategist is also concerned about the relationships between the three. Thus, the strategist fits various pieces together to achieve a purpose. Those various pieces (design elements) include insights, as I will explain later in this article. To explain the relationship of insights and design of strategy, consider this example of Starbucks. Starbucks designed its strategy by allocating its resources in light of the competitive challenge. Howard Shultz, traveling in Italy, recognized an opportunity to replicate the coffee bar experience in the United States. His insight on competitive challenge was that no potential European rival was operating a similar concept in the US, and competitors in the US were not focusing their efforts on delivering a retail coffee experience. The strategic resources at the time of founding of the concept were Starbuck’s presence in the coffee business as a roaster, which gave it the strategic resources of a viable supply chain and business presence. Shultz realized that he could apply the strategic resources by extending them into an area that had no competition, and he could experiment and learn from mistakes because the there was insufficient competition. Let’s examine the Starbucks situation then through the lens of Rumelt’s tradeoffs. Importantly, the competitive challenge was weak. This reduces the pressure to possess high-quality strategic resources and the need to act in a clever fashion. Starbucks could experiment with its resources to find the right combination for the American market. Finally, let’s look at Starbucks in contemporary times. In the US, Starbucks faces strong competitive challenge from numerous national rivals: Dunkin Donuts, McDonalds, Caribou Coffee to name just a few. Theory suggests that greater competitive challenge means that there needs to be greater strategic resources combined with coherent action to apply the resources. That is what we see in the case of Starbuck’s. It has built a strong base of strategic resources: a well-known brand, network of stores, distribution channels and strong supply chain. It more cleverly applies its resources: its focus on consumer experiences and loyalty (store design, loyalty cards), its product development (instant coffees, teas), and its international market expansion. In domestic markets, Starbucks’ enduring success is going to depend upon finding and applying insights that give it advantage over its rivals. Design as strategy is concerned with gaining advantage through well-designed products and other offerings. Apple Computer’s products are frequently cited as exemplars in this case. Design of strategy is concerned with gaining advantage of the overall business model to gain or sustain competitive advantage. Apple’s skilled designers are but one competency (manufacturing, branding, channels being other notable strategic resources) that determine Apple’s ability to prevail over rivals like Samsung, Google, or Microsoft. By using trail-and-error development of the business model, Starbucks was able to learning about customer needs and build up its resources before others recognized the scope of the opportunity. This is an example of design thinking: Starbucks uses design of logos, store layouts, and product as element of its strategy. Starbuck’s design talents are strategic resources, but not its only strategic resource. In design thinking the context of the problem might be a piece of land or a medical device in a patient’s body; the design problem is to optimize the form, function, and fit of the designed solution. In strategic thinking, the context includes the external business environment, stakeholders, and rivals. The specific design problems to be solved in strategy is devising a set of actions that results in a gained advantage over rivals. As an interesting idea for guiding strategic thinking, I believe we should differentiate the design of strategy from design as strategy. Do you agree with the idea that strategy is designed, not decided? How have you used this idea?